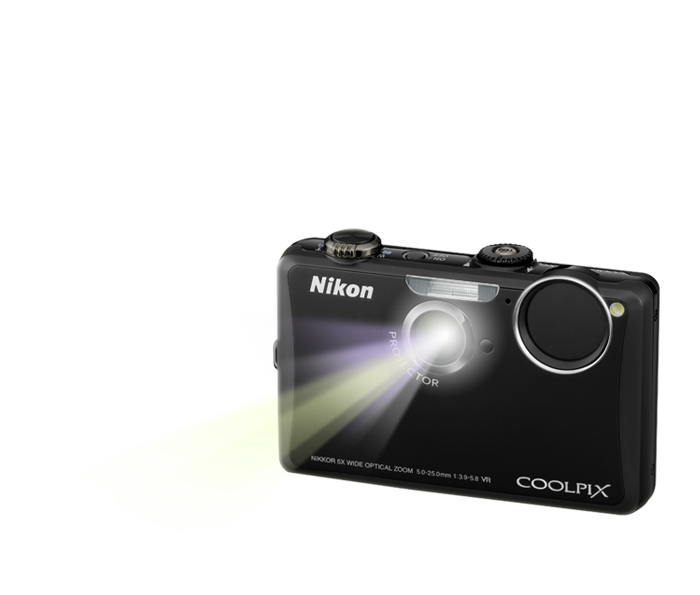 14.1-megapixel CCD sensor for stunning image quality. Incredible Built-in projector. Share slide shows—with music, if you'd like—as well as HD movies by projecting them from the camera onto any flat surface. Or connect the camera to a computer and project whatever's on the computer's screen. 5x Wide-Angle Optical Zoom-NIKKOR Glass Lens. Versatile 28-140mm lens ranges wide to capture landscapes, zooms in to get close to the action. In the NIKKOR tradition of precision optics, the high-quality glass lens delivers superb colour and razor-sharp results. High ISO up to 6400 for optimum results when shooting in low light or photographing fast-moving subjects. 3-inch Touch Clear Colour Display. High Resolution (460,000-dot) display for still images and HD movies that come alive with rich detail and improved contrast. The Touch Control Display makes it easy to write or draw on your pictures—even while they're being projected. ISO can be set up to 6400. In camera Picture Editing includes Quick Retouch, D-Lighting Draw, perspective control, Soft Focus, Selective Colour, Cross Screen, Fisheye effect, Miniature effect and more. Adjust Scene effects (brightness and colour) within scene modes. Built-in Slide Show with Music. Record HD (720p) Movies, with one touch control button. Easy projection playback or watch recorded movies in-camera, on TV or computer. In-Camera Red-Eye Fix automatically corrects most instances of red-eye as you shoot. You may never see red-eye again. Face-Priority AF Nikon’s face-finding technology automatically focuses on up to 12 faces. Blink Proof automatically takes two sequential shots and saves the one with eyes open. Subject Tracking will track a moving subject to ensure sharp focus. Touch Shutter simply touch the LCD monitor to take a picture. Easy Auto Mode automatically recognizes the scene you're shooting and selects the most appropriate scene mode; offers six scene modes plus auto. Macro shooting as close as 1.2 inches. 220 shots (approx.) with supplied EN-EL12 Li-ion rechargeable battery. Unless otherwise stated, all figures are for a camera with a fully-charged Rechargeable Li-ion Battery EN-EL12 operated at an ambient temperature of 25°C (77 °F). Measurement, measuring conditions, and method of notation all comply with ISO 21118. *Based on Camera and Imaging Products Association (CIPA) standards for measuring the life of camera batteries. Measured at 23(±2)°C; zoom adjusted with each shot, flash fired with every other shot, image mode set to (14M) 4320×3240. *Battery life may vary depending on shooting interval and length of time menus and images are displayed.